Where Did The Rooster Come From??? After long consideration, I made a selection of baby chicks last March, placed them in a box, labeled them and brought them home. Check. Six Ameraucana, check. Two Buff Orpingtons, check. Everything began to change once the yellow fluff began to change to feathers. 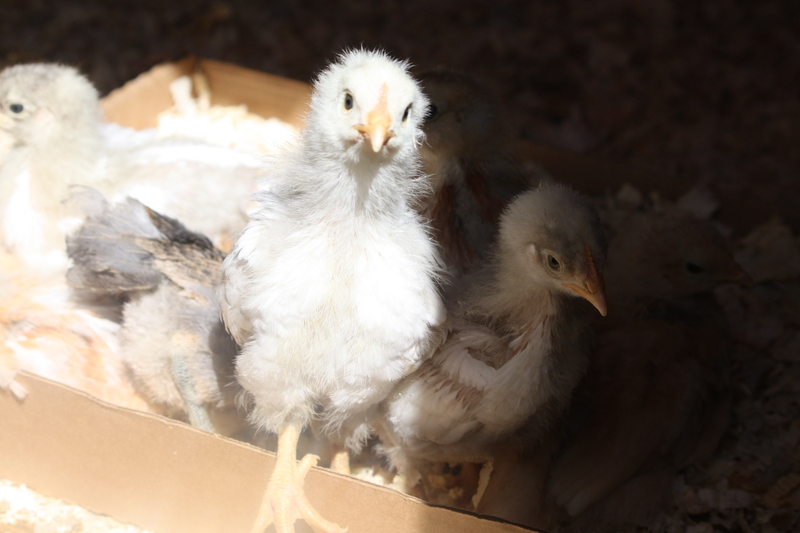 I noted I had three rather white looking chicks, but did not become concerned. As I pondered which names to give them, I selected the obvious white pair to become Martha and Mavis. 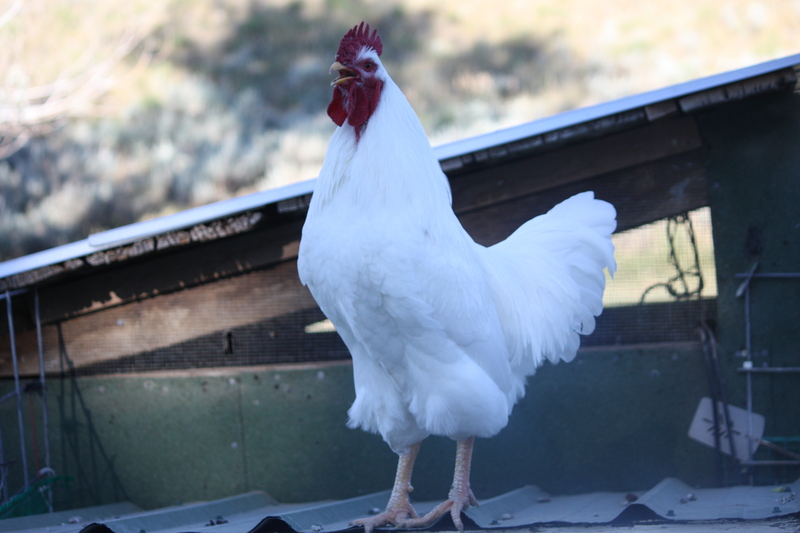 It was clear they were neither Ameraucana nor Buff Orpington but what the heck. They were very pretty and grew amazingly fast! I could not discern whether they were Leghorn, White Cornish Rock or what. 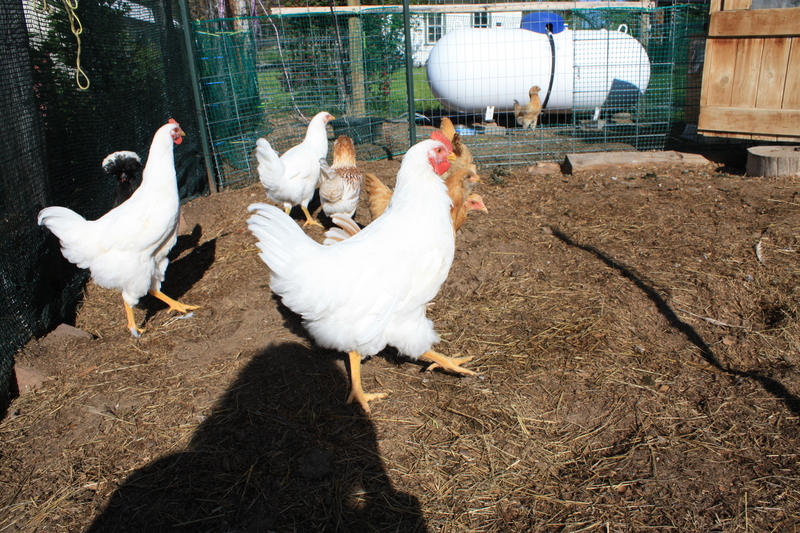 By the end of June they had surpassed everyone else in the pullet house for sheer size. One day as I was standing in the garden nearby, I heard a strange squawking sound, as if the chick was strangling. It was the larger of the two white ones, and after a few moments, he squawked again, attempting to crow like a ROOSTER! I should have recognized trouble right here, which is where it began. I named the big white fellow Cromwell, with implications right from the get go that he was likely to lose his head just like his namesake. And then the unthinkable happened. The other big beautiful white chick started making strangling noises and practicing to crow like a rooster too! I should have marched back to the feed store right there and then and demanded my money back for these sexual deviants who were not going to lay any eggs! I attempted to pawn Clarence off on neighbor Tom by slipping him next door in his hen house. I figured it would take at least a week for him to notice he had an “extra” if he didn’t notice something waking him up at 4:00 a.m. first. Who knew? Tom said he loved hearing roosters crow, and maybe he would want to keep Clarence. It didn’t take 24 hours and here came neighbor Tom in the golf cart. A large cage was sitting up front of the cart and sure enough, inside was Clarence, the ill gotten rooster. Ah well. Clarence returned to the pen older, wiser and meaner for the experience. He immediately began to pick on everyone–I guess those chickens at Tom’s were pretty unwelcoming. I tried isolating Clarence and Cromwell next door in a separate pen. They immediately figured out how to fly over the fence and re-join the flock. This was going to require some action on our part that I wasn’t looking forward to. By this time, however, I was getting quite fond of Cromwell, who was behaving in a most gentlemanly fashion most of the time. Could I keep just one rooster? We are working on an extension of the fence that will require Cromwell to stay home by himself. Clarence rests up on the hill in the pet cemetery after a gentle demise, and the rest of the little flock are being moved to “the big house” tonight where they will find nesting boxes and room to roam. Next year Cromwell is going to the fair. A more splendid specimen can rarely be found and he is sure to win a ribbon. I love chicken soup with lot of garlic.